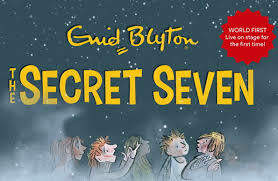 When Storyhouse announced that its first Christmas show was to be a live stage adaptation of The Secret Seven, it was as if a childhood dream had come true. The classic Enid Blyton stories were a firm favourite of mine growing up. As much as I loved The Famous Five, also famously written by Blyton, The Secret Seven just felt more relatable to me. They made their plans in the garden shed, their adventures were set locally with parents often getting in the way, ruining their best laid plans with talk of bedtime and chores! By contrast the Famous Five spent a questionable amount of time alone, visiting strange island’s and doing what they pleased. So, whilst the Famous Five books are arguably more widely known and may have been a more obvious choice for an adaptation. I think we can all relate to those early childhood dreams of seeking adventure, sibling rivalry and getting told off in front of your mates by your Mum. 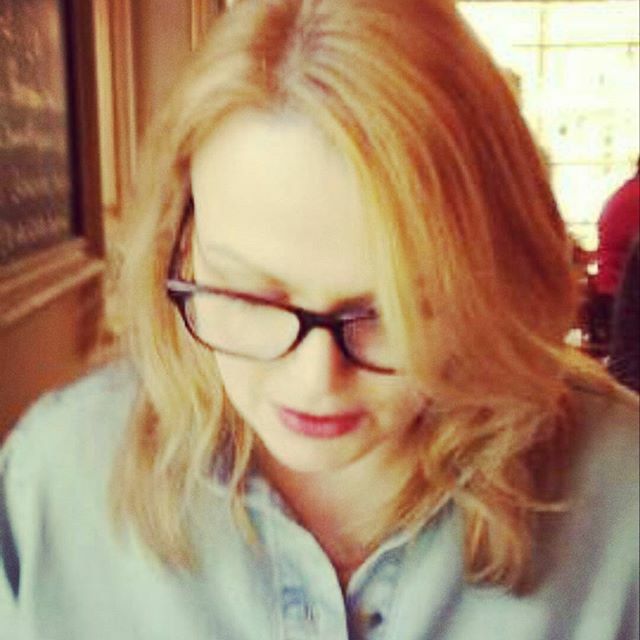 More so, than being packed off for the summer to a great Aunts, following bearded strangers and finding hidden treasure anyway. I was lucky enough to attend the press evening of the Secret Seven with my daughter, Seren who has never read the Secret Seven books before, so was looking at the show with a completely fresh pair of eyes. I am thrilled to say she loved it just as much as I did, so much so that she has now added all of the books to her (still ever growing) Christmas list. Seren is an avid reader, just like her Mum, and she always say’s that the best stories are the ones where you feel as if you are transported into another time and place. Where you feel like you are part of the adventure itself, and both Seren and I can honestly say that Glyn Maxwell’s stage adaptation did just that! Directed by Storyhouse’s very own artistic director Alex Clifton, The Secret Seven is set at Christmas in the quintessentially British village of Cherrydale, and the austerity of a post WW2 Britain. It is here the seven friends unwittingly stumble into the adventure that they have been so desperately looking for. Despite the lack of a saucy pantomime dame or a nativity donkey in the show, it really does feel very Christmassy! I’m not sure if it was the Christmas carols, or the beautifully decorated trees which set the scene, as you enter Storyhouse that did it. Or, if it was the set cleverly designed by James Perkins adorned with branches, twinkling fairy lights and dark corners. I could almost feel the warmth and cosiness of Peter and Janet’s garden shed, see the snowy rooftops. and feel the cool crisp air of Cherrydale at night. Seren also really enjoyed the use the cast made of the stage, climbing telegraph poles, being strung from the ceiling, going down into the stage floor, running on and off the stage. The set felt ‘bigger’ than it actually was because of it. The story itself starts with Joko the baddie – there’s got to be a baddie in a Secret Seven story and Joko is certainly that – and Goldie, a young girl who is a clown in the local circus, and who he has stolen. Goldie never speaks, yet Seren said she still understood everything Goldie was trying to say. An understated and yet captivating performance by local student Evangeline Hartley. We learn that Joko wants his revenge on Cherrydale, and he is going to steal all the presents from the children on Christmas Eve using Goldie to do it. The opening scene was dark in both mood and lighting, but then kidnapping a girl from the circus and keeping her in an abandoned house will do that I guess. Joko played by Nick Figgis and had a bit of a Jonny Rotten, cockney wide by persona going on for him, he also played the role of Peter and Janet’s Dad, I had no idea! As the bad guy, Joko doesn’t redeem himself in any way as you would expect in a Christmas show, unlike his somewhat bumbling buffoon of an accomplice Nimms, played by Joel Sams. A hapless, blundering council employee, and you could see he was wondering what on earth he’s got himself involved in with every arm jerk, face twitch and blinking eye. The Secret Seven come across their sinister plan one dark, cold evening and make a pact to not involve their parents or police and solve the mystery themselves. so standard Secret Seven behaviour! In the books, as much as I loved the adventures they had, it did kind of feel to me that the characters of the seven kind of morphed into one another, They were sometimes almost secondary to the story. That is definitely not the case in the stage show, they seven really do come alive in every way! I mean who knew Barbara was so loud and bossy and had such a strong Scottish accent? Brilliantly played by Molly Logan. Who knew Jack was from Liverpool and was so forgetful and clumsy. George Caple who plays him and Anton Cross who plays a nervous, excitable George were very funny together. Especially in the scene where they stumble across Nimms in the midst of stealing Christmas gifts, who then tries to pass himself off as an elf! Pam see’s things a little differently than the others, and seems younger. Played by Aryana Ramkhalawon who portrays her as innocent, excitable and sweet and talks so fast you can’t keep up! And then there is Colin, slightly superior, know it all Colin. Great performance here by Kaffe Keating, his lines made for some real laugh out loud moments. Of course, we have the ‘‘heads’ of The Secret Seven. Kind, responsible Janet played by Harriet Slater and her brother Peter played by Harry Jardine. Someone who seeks adventure, and wants to be brave but is also a little unsure of himself. And who could forget the most important member of the Secret Seven society? Scamper! OK so there was no real dog on stage for the whole performance, much to Seren’s disappointment BUT puppet Scamper isn’t a bad substitute at all, in fact he is amazing! He looks so realistic and we see him communicating with his owners in barks. we think we hear “Mum” at one point to get her attention. He also plays an important part in the mystery, guarding Goldie and seeing off Joko, and we get to see real Scamper at the end. Peter holding the beautiful golden haired spaniel Scamper in his arms, singing Christmas carols? I’m got to admit I got a bit teary eyed. Much to my Daughters dismay! Now, as much as I hate to say it and you really should never have favourites when it comes to children. As outstanding as all the cast were in their performances, even down to smaller parts such as Peter and Janet’s’ parents, and the ‘Greengrocer’ another local student Thomas Martin, who comes to Peters aide with solving the crime. (A very funny moment when you realise why he’s called the greengrocer!) There were two characters that stood out for me and they were Jack’s sister Susie and her friend Binkie played by Rebecca Birch and Tillie-Mae Millbrook. They were an absolutely hilarious comedy duet, who bounced off each other on stage oozing fun, personality and feistiness! A real ‘whatever boys can do we can do better’ attitude, my daughter loved them and Binkies lyrics! I loved the way that despite the fact they were dismissed by Peter and Jack at the start. it is thanks to Binkie and Susie the Seven solve the mystery! As expected the story ends with the Seven saving the day, and Christmas, and some fun audience participation, carols and even Santa thrown in too! All you could want from a festive show. 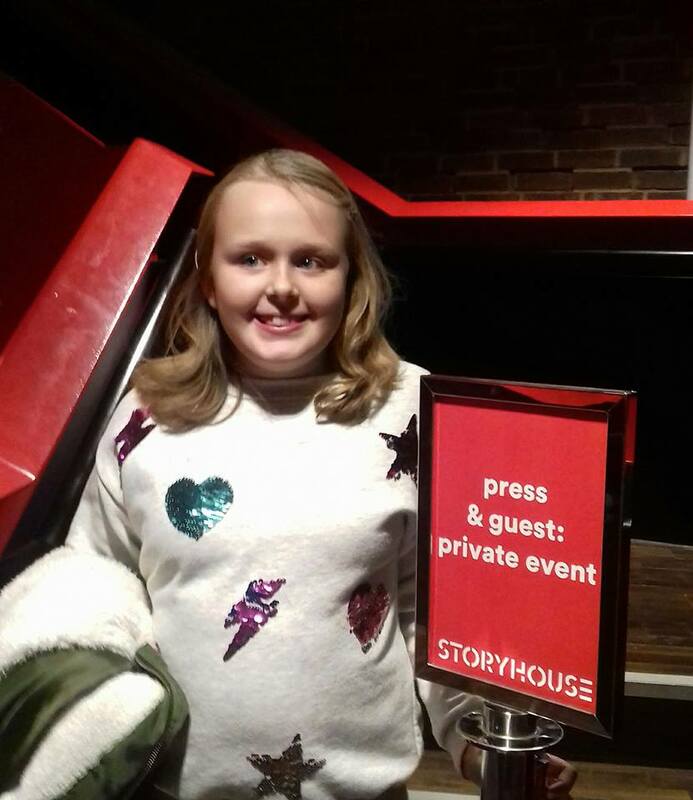 Some may have raised eyebrows that your typical Christmas panto was not on the menu for Storyhouse’s very first Christmas. For me? it felt absolutely right that instead, it celebrates it with a world’s first on stage adaptation of a much loved children’s classic. And what a job they did.